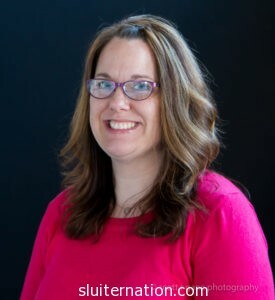 Katie Sluiter (pronounced “Sly-ter”) is a wife, a mother, a teacher, a reader, and a writer living in a small town in West Michigan. She has a Masters Degree in English Education from Western Michigan University and teaches in a Junior High School near Grand Rapids, Michigan. Katie writes for The Educator’s Room and has been featured on Borderless News and Views, BlogHer, and BonBon Break. She has also contributed to the Imagine Toys blog, The Mid, Nerdy Book Club, Writers Who Care, and TODAY MOMS. Her writing has been published in the 2012 anthology of Every Day Poets, the May 2013 issue of Baby Talk Magazine, the book Three Minus One , the anthology My Other Ex, and in the Language Arts Journal of Michigan. Most recently her essay about her struggle with postpartum depression was published in Mothering Through the Darkness: Women Open Up About the Postpartum Experience. She has presented at both the Michigan Council of Teacher of English (MCTE) annual conference and the National Council of teachers of English (NCTE) conference. Katie was one of BlogHer’s 2014 Voices of the Year. Sluiter Nation by Katie Sluiter is licensed under a Creative Commons Attribution-No Derivative Works 3.0 United States License.